Introducing a new and exciting category of RealTracks - Video RealTracks! Have you ever listened to your favorite RealTracks guitar solo or RealDrums drum fill and wondered exactly how the player did it? Well, now you can see the actual footage of the musician playing along with your song! We have 40 Video RealTracks to choose from, including two full video bands – so you can create a video with up to 5 musicians playing together. 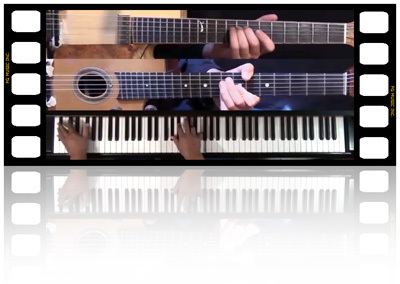 You can even include a chord sheet or notation in the video to help you learn, teach, or share with others! $19 Buy and Download Now ! 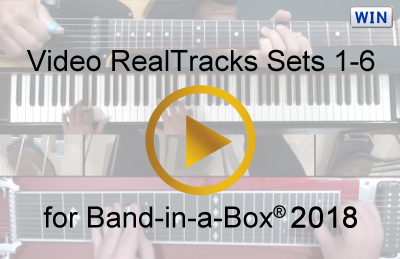 An entire pop country band is at your fingertips with Video RealTracks Set 1, and you'll be able to see exactly what the musicians are playing with Video RealTracks! Two Brent Mason guitars are included: one that plays a twangy single-coil rhythm part that arpeggiates open chords, and the other uses a similar tone but plays a tasteful and melodic solo. Eddy Dunlap pedal steel is also included, playing a beautiful and haunting background style. Byron House bass and multiple Shannon Forrest modern drums styles pull it all together with alternating bass notes and variety of pop country beats respectively. Mike Rojas acoustic piano adds emotion with powerful pop comping that utilizes great chord voicings. All of the included RealTracks play in all 12-keys. You can even watch this whole band at once by creating a Video RealTracks stack! This Video RealTracks Set is a delightful double-time train-beat country band that includes two drum styles and five instruments. Two Brent Mason guitars are bundled: one plays a twangy, syncopated, and spanky rhythm part and the other plays a solo with all of your favorite train country riffs. The rhythm is covered by an alternating Byron House electric bass with accents on the quarter note and a choice of TrainBeat drums for a big sound or TrainBeatBrushes for something a little subtler. Both drum styles are performed by Shannon Forrest. Mike Rojas tackles piano with alternating bass in the left hand and broken chords in the right hand. Train-beat pedal steel switches between held notes and faster riffs, and is performed by Eddy Dunlap. All of these amazing instruments are available in 12-keys and can be stacked together in a single video so you can view the entire band! Jazz favorite Oliver Gannon is featured in this amazing jazz guitar Video RealTracks Set. Four rhythm guitars are included for a variety of jazz needs, including a 110-bpm bossa, an 85-bpm jazz ballad, a 110-bpm jazz waltz, and 140-bpm jazz swing. All of these beautifully played instruments were recorded in all 12 keys to ensure that your arrangement will sound great in any key. They also feature video, notation, and guitar tab so you can watch exactly what Oliver Gannon is playing in your song! Bring your jazz guitar skills to new heights or create a beautiful arrangement with Video RealTracks Set 3: Jazz Guitar with Oliver Gannon. 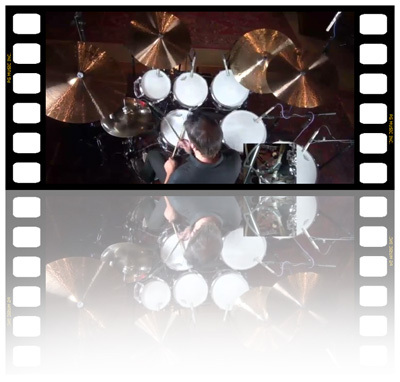 A collection of thirteen masterfully performed Video RealDrums styles performed by famous Nashville drummer Shannon Forrest. Whatever your country or pop rhythm needs, this Video RealTracks Set has you covered. Rhythms include pop rock in a variety of feels (even 8ths, even 16ths, swing 16ths, swing 8ths), several variations on pop shuffles, modern and classic country 16ths, and driving pop 8ths. These great drum styles also have video available, so you can see exactly how these beats are played in your own song! Give your pop or country mixes that famous Nashville sound with Video RealTracks Set 4: Pop and Country Drums with Shannon Forrest. There is something for everyone in this eclectic Video RealTracks Set. The masterful Gypsy jazz guitar skills of Quinn Bachand will instantly transport you musically to the early twentieth century - a comping acoustic guitar and an electric guitar soloist are included. That alone would constitute a great addition to your RealTracks library, but we've also included a straight-feel, 12-key blues acoustic piano performed by none other than Mike Rojas. This piano will fit perfectly with your down-tempo even-feel blues arrangements or even with pop or country songs. 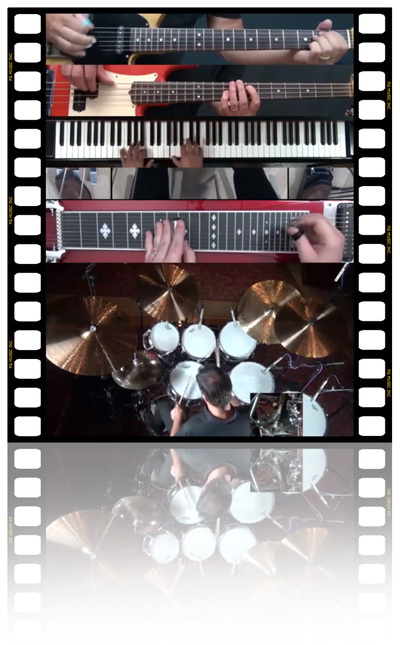 And of course, all of these instruments come with video so you can see exactly what the artist is playing in your song. Don't delay, pick up this great collection today! Three Celtic acoustic guitars are performed by notable Celtic accompanist Quinn Bachand in this Video RealTracks Set. Enrich your Celtic arrangements and folk compositions alike with these amazing and unique sounds, and then see how they're performed by viewing video of Quinn playing along to your song! The three guitar styles covered are all at a native tempo of 140 bpm but have different feels. A "4 to bar" style sticks to a simple quarter note rhythm, a polka and fast reel style will enthrall you with rapid and meticulous strumming, and a Celtic-slide jig switches things up with a swing-eighths rhythm. Don't miss it out on this amazing collection of Celtic acoustic guitars! Q: How do I get the latest version of Band-in-a-Box? A: We have packages for first-time or existing customers. Use the convenient chart to find the right package for you. Q: If I purchase the UltraPlusPAK or EverythingPAK, do I really get a free USB Hard Drive for no additional charge? A: Yes, Band-in-a-Box is pre-installed on a hard drive. You can use it directly from the hard disk, or copy it to your computer.